Before you study the information below, it is helpful to understand that professions were valued differently in ancient times than they are today. Likewise, the value of items was different then than now. For instance, in today's world, one might spend 20% of their total income on food, but in ancient times the cost may have been 50% or more of one's total income. In fact, during parts of the history of Rome, food costs were so high that without free wheat subsidies from the government, the common people would not have been able to survive! These subsidies were known as ‘doles' and according to AEJ Morris'sHistory of Urban Form[1970 George Godwin LTD], up to 1/3 of the citizens of the capital city received this public assistance. Grain formed the foundation of the common Roman's diet. 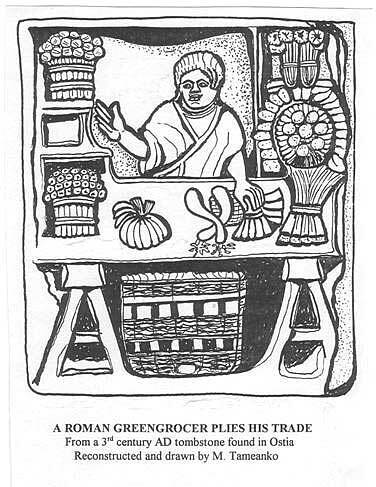 It was not uncommon for grain to be the only thing a poor Roman ever ate. The cost of baking bread was very high to a poor Roman, so if no access to a communal, public oven could be had, the grain would be crushed and made into a porridge known as ‘puls' that was likely similar in taste and texture to modern polenta. While we take it for granted today, meat was an extravagant luxury that most Romans could not afford to indulge in. Clothing was another expensive proposition. One‘libra'(Roman pound, just under of a modern pound, 326 grams), of fine silk cost more than a dozen human beings. It seems absurd to us today, but such was the case, because ancient Romans lacked the production machines of today that make cheap fabric possible. For the commoners, fashion was not a consideration. Clothing was utilitarian, had to be durable, and was patched until finally the garment became the thing from which patches were taken for its replacement. Historically, the cost of living has expanded to consume all of the income that is available to the majority of the people in the society. As technology has enabled faster production, technology has also introduced new things to consume the income the increased productivity creates. The ancient Romans did not have many things to pay for in comparison to life today, yet it was every bit as much a struggle for them to survive as it is today, and probably, it was even more of a struggle. As you read the data below, consider what you might have been in ancient Rome. Would you have been a carpenter? A mason? Would you have been fortunate enough to receive an education and become an advocate (ancient equivalent of the modern lawyer)? Pick your profession, and then take a look at the kind of food and clothing you would have been able to afford. You might gain a new appreciation for modern life! All the prices and wages are listed indenariicommunes, which were not actually silverdenariias we usually think of when discussing ancient Roman coinage. Denarii communes, or d.c., were notational currency. What this means is, an exchange rate was given, telling how much of the currency in circulation at that time (nummi) it took to equal one d.c. This made it easy to change the value of the money in circulation, without having to rewrite and redistribute the entire edict. A series of exchange tables are at the end of this handout. A teacher in ancient Rome would have lived in the home of a wealthy patrician, who would have provided the teacher with food and clothing appropriate to the house. The teacher would not have had much spending money, but would have lived comfortably just the same. These are salaries indenariiper month, per student. Soldiering was one of the best ways a Roman male could provide for his family. The base wage was low, not enough to live on. Four times a year, a soldier received a "donative" greater than his annual base pay. Additionally, soldiers received an annual "annona" subsidy for grain purchases. The best soldiers hoped to be recruited to the Praetorian Guard, the soldiers who guarded the emperor. These soldiers were paid roughly 3 times the base wage of the average soldier, and likely enjoyed many additional privileges as well. Soldiers had high expenses in their profession, but they still came out much better than the average citizen even after expenses. The soldiers were expected to pay for much of their own equipment, rations, and clothing. They even had to pay part of the cost of burial for their fallen from their unit. 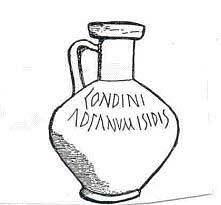 The Edict of Maximum Prices was an attempt to control runaway inflation and poverty in the Empire. The penalty for exceeding the prices of the Edict was severe: death. Not satisfied to execute just the seller, Diocletian decreed that the buyer was to be executed as well. As a final measure, if a seller refused to sell his goods at the stated price, the penalty was death. Prices refer to one modius unless otherwise indicated. 1 modius=8 liters dry measure. Prices refer to one libra unless otherwise noted. 1 libra=326 grams or just under pound. Prices are per item or libra for raw materials. †Purple silk was to be used only at the direction of the Emperor under penalty of death. From 297 to 308 A.D.
Soldiering was one of the best ways a Roman male could provide for his family. The base wage was low, not enough to live on. Recognizing the importance of the soldiers, the emperors paid what can be equated to a quarterly bonus. Four times a year, a soldier received a "donative" greater than his annual base pay! Additionally, soldiers received an annual "annona" subsidy for grain purchases. Furthermore, the best soldiers may have been recruited to the Praetorian Guard, the soldiers who guarded the emperor. These soldiers were paid roughly 3 times the base wage of the average soldier. Praetorian Guards were respected and feared, even by the emperor himself, and likely enjoyed many additional privileges as well. † Some employers supplemented the salaries of these professions with "Keep". That meant that the worker was allowed to retain some of what they produced- usually scrap or in the case of grain, what could be carried from the ground at day's end. This was a huge benefit to the worker... and perhaps the source of the phrase "Earns his keep." ‡ The teaching professions were paid the amount shown per student. Teaching was done in the homes of the wealthy patrons who hired the teacher for one-on-one educating. The style resembled today's tutoring more than the Greek or current models of classrooms of many students. Thus, teachers were paid poorly. It is assumed that room and board were often provided.